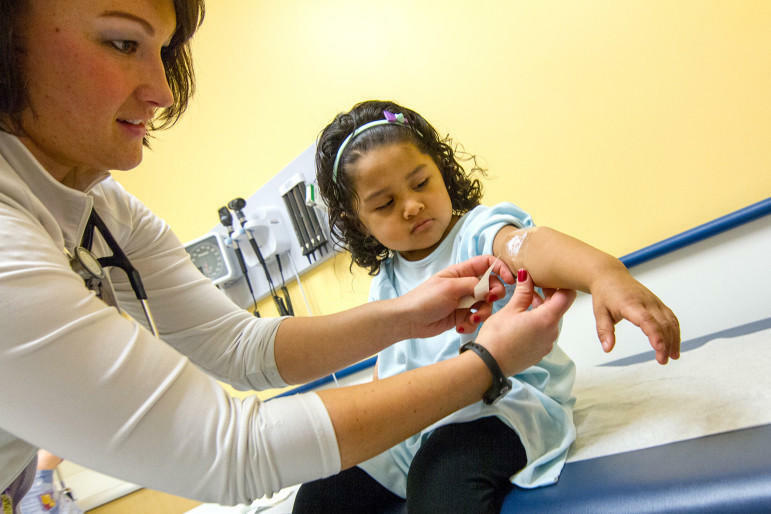 Angely Nunez, 3, watches as Lauren Frazer, a nurse at Connecticut Children's Primary Care Center in Hartford, applies a topical anesthetic to her arm before a blood draw to check for lead levels. The number of children exposed to lead has declined since the 1970s, and the incidence of lead poisoning has decreased significantly due to awareness and education. But health officials say it’s still a problem. About a half million children a year nationwide, between the ages of 1 and 5, test positive for lead in their blood. And there are no safe blood lead levels, according to the Centers for Disease Control. Even low lead levels can have long-term effects on a child's IQ, academic achievement, and ability to pay attention. Higher levels can cause irreversible brain damage, slow growth, and other developmental delays. Homes are the primary source, according to Dr. Carl Baum, Director of the Yale Regional Lead Treatment Center. Dust that contains lead paint, which was banned for household use 40 years ago. But houses built before 1978 are likely to contain some lead-based paint or pipes. That accounts for about 83 percent of the homes in New Haven alone, where more than 300 children a year test above the CDC’s lead level of concern. That level is currently set at 5 micrograms of lead per deciliter of blood. It’s the lowest reference level the CDC’s ever set. Baum said children should be tested twice between the ages of 1 and 3. And it’s not just water and chipped lead-based paint that’s pushed the issue of testing. Children can also be exposed to lead through other sources including soil and toys. 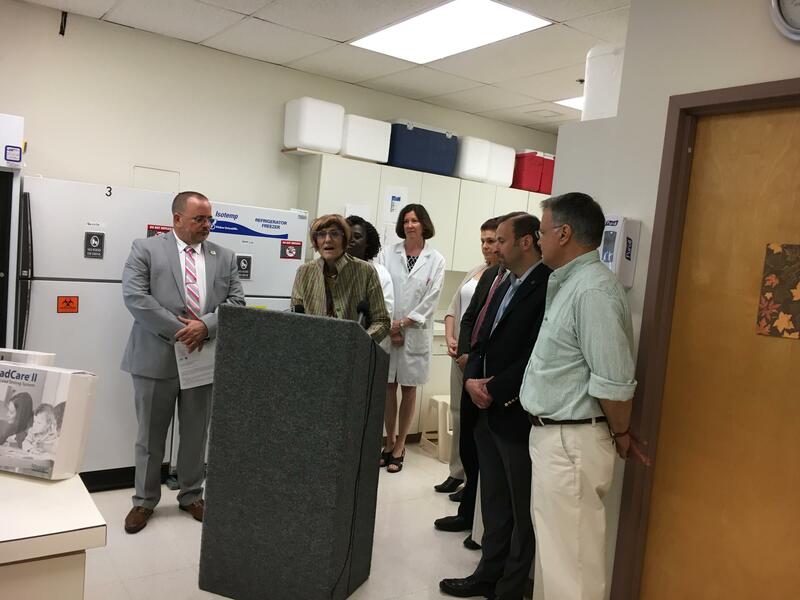 Congresswoman Rosa DeLauro announces a new bill to increase funding for lead testing and treatment at New Haven Health Department Clinic. Congresswoman Rosa DeLauro calls it a crisis. In response, she’s sponsoring legislation that would increase federal funding for the CDC’s Lead Poisoning Prevention Program, from $17 million to $150 million. “What does the money do? It is money to the states for screening, for referral for treatment and for case management for children who have lead poisoning,” DeLauro said. DeLauro said the bill is not enough to combat lead poisoning nationwide, but it would certainly be an improvement. 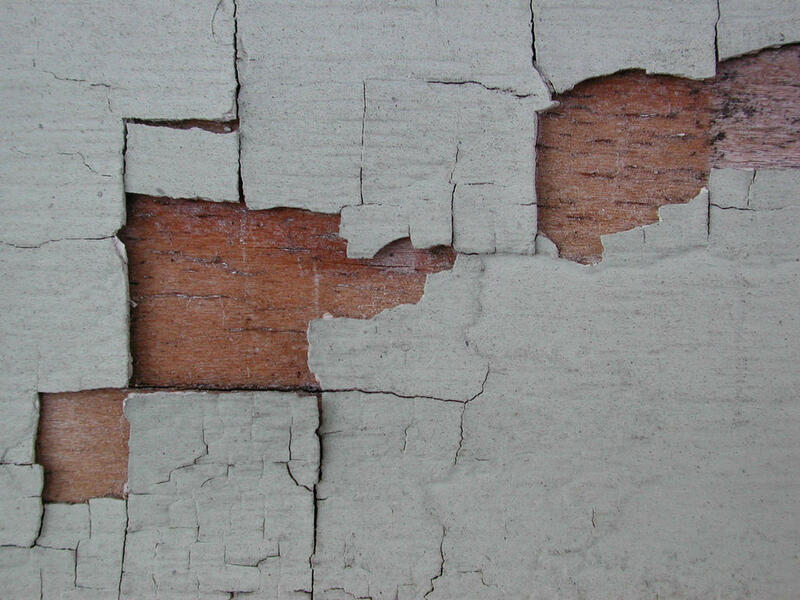 In Connecticut, the Department of Public Health reported that 2,500 children had lead poisoning in 2015, with more than 1,500 new cases identified.